"I speak to your soul, and that's above money..."
A rough month out there. 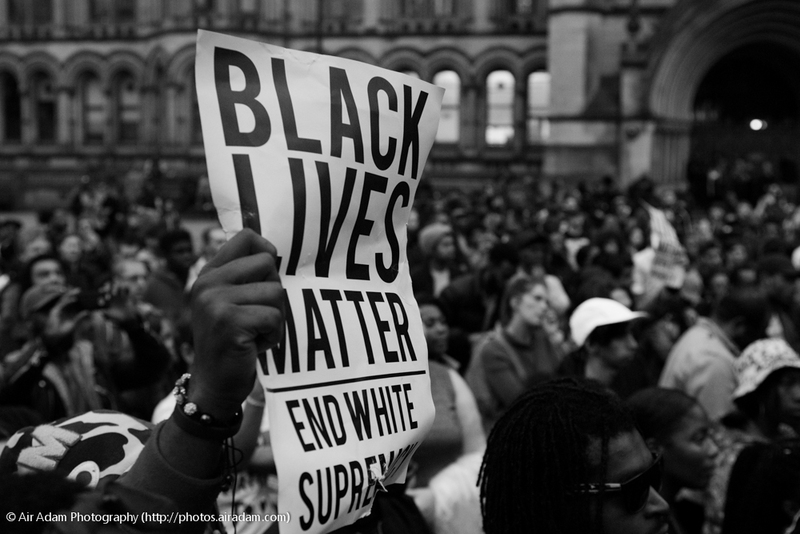 With yet more killings of unarmed Black people by police hitting the news and galvanising protests worldwide, the issue feeds into some of this month's selection. Overall, I've got a couple of good local tracks, one song almost everyone will know...and a stack of stuff you probably don't! It's certainly not an exclusively human rights/political selection, so hopefully I'm not out of line with this month's cover art. Don't forget to get your ticket for Pete Rock & CL Smooth in Manchester in September! The first time I heard this, Smif-N-Wessun were performing live at The Roadhouse (RIP) and the second time, they were at Band On The Wall. Now I have my own copy of the "Born & Raised" project and I can play it at home as much as I like :) Great Beatnick & K-Salaam-produced track with the reggae influence that has marked so much of their work, highlighted by the featuring of the titan Junior Reid from Black Uhuru. Can't even remember how I first found out about this one, but it's a nice relaxed number from the Flemish chill-out master's "Gemini" album - good Sunday morning track. Freebass 808 is a side project by Geechi Suede of Camp Lo and the group's sometime producer Apple Juice Kid, and for their first inclusion on the podcast we go to their 2008 debut release, the "MoonBass EP". At the time, I didn't really know who Janelle Monae was, but it was a great move of them to bring her in on this one - she fits the experimental vibe to a tee. Pusha is an incredibly adept MC, and what comes across in his bars here is an air of utter contempt towards anyone who thinks they can compete with him. The beat is apparently a Diddy production, and while I don't know if he was actually the man on the MPC or whatever, this is some quality work. Those muted horns work really well underneath the loosely-timed hats and tight kick drums, and where the barely-there hook comes in, you get some keyboard bass too. Straight fire from the "King Push - Darkest Before Dawn : The Prelude" LP. One of the classic Hip-Hop singles - I think most of you will know this one, or at a push, recognise the beat from a recent car advert in the UK! Truthfully - having first heard dead prez on tracks like "Selling D.O.P.E" and "The Rain & The Sun", I absolutely couldn't get my head round why this record sounded this way when it came out, and wasn't much of a fan. In fact, I passed on buying the 12" and got this on "let's get free" when that came out. Over time, this self-produced bomb grew on me, in no small part because the lyrics were always on point! Needed something around 80bpm here that was also kind of technological and after enjoying the production on Trae's recent "Another 48 Hours" mixtape, I sought out the men behind the beats to see if they had any instrumental projects, eventually finding the "Hurt" EP/mini-album. Not all my speed, but the Sade sample in the background on this one pulled me in! Shout out to my man Black Robb for putting me up on this track! Interesting idea; each verse is made up of eight bars of lyrics, followed by another eight bars of (mostly) the same lyrics backwards. A kind of palindromic structure, in rhyme form! It's not perfect, but the difficulty involved in writing this way is something hard to comprehend for a non-lyricist. I've heard this likened to Nas' "Rewind", but that really is something different - a story told with time running in reverse. He's generously offered this one up free on Soundcloud, so get yourself a copy there. Many of you will primarily know Killer Mike as half of Run The Jewels, but this tale of an illegal police raid comes from "R.A.P Music", his most recent solo release - preceding the RTJ catalogue. This album was the genesis of the El-P/Mike combination, and the heavy, aggressive production of El-P matches the vocal performance perfectly. Oh, and just so you know - he really is the son of a cop. Originally coming out as part of the LA group Freestyle Fellowship, Aceyalone is a highly creative MC who's appreciated by the connoisseurs of lyricism. The 2003 "Love & Hate" album, his fourth solo release, isn't afraid to go left-field, and right here RJD2 gives him a backdrop derived from Jean Michel Jarre's "Equinoxe 4" to rhyme and rhyme over. No hook, just an absolute torrent of lyrics. One of my (many) favourites from the outstanding "Time Will Reveal" album, I thought that for this year's commemoration of the passing of KMG that we'd go with this selection that of course is twenty years old this autumn. Cold 187um and KMG split each verse down the middle, going back-to-back over 187's ridiculously dope, dark instrumental work - once again showing he's one of the unsung heroes of the artform. This track makes me sad there'll be no more ATL releases...those contrasting vocal styles over those beats...classic. Of the people who do recognise this instrumental, I think most will know it as the beat from Styles P and Pharaohe Monch's "The Life", but it originally came from this Major League 12", on the B-side of "Clubber Lang". I'm not sure how it came to be re-used at a time when such things were pretty uncommon, but it clearly made an impression on all three MCs. Back with just a piece of another ATL track which fit perfectly here, this time from the "Uncle Sam's Curse" LP, which is an expensive one to buy these days - wish I'd bought two when it came out! The creep on this beat is mean, and Cold 187 kicks a tale that some of us know all too well; being stopped by the police for no good reason. The second verse, while still a good one, kind of strays from the topic so I decided to cut it short - but it's still worth getting the full version, and the whole album if you can afford it! I've seen this labelled as a Dr.Dre unreleased track, a Sam Sneed track, and as listed above - whatever it is, I picked it up in the dark, wild west days of the early 21st century internet, and as far as I know it hasn't had a commercial release, so here it is for you! It takes the same sample as Heltah Skeltah's "Letha Brainz Blo" as well as centring the "let the madness begin" lyric they use on that track. The vocalist R.C. (aka Ruben Cruz) released an album "Rubenaughty" that was so under the radar that Discogs have missed it from his discography! Now we come to an MC and producer from Manchester who's been honing his craft for many years! We performed together with me on the beats in his younger days, and he rose to the next level with his work with The Natural Curriculum before spreading his wings as a soloist. His first album, "One For Being Me", from which this is drawn, was as true a picture of the man and his outlook as you could imagine - one to check. Going back to Termanology's first studio album "Politics As Usual" (following on from the "Hood Politics" mixtape series) for a reflective cut produced by the legendary Large Professor. Along with the low speed, check how the groups of three hi-hats - with the "fourth" missing - affects the pace. That bassline is the star of the beat though, expertly done. Glorious instrumental from the free "Laura Mvula Chopped" project, a tribute to Birmingham's own songstress! As with the rest of the tracks on it, they chop up a tune from her live performance of her "Sing To The Moon" and then add layers of extra flavour. This is a beat project that every appreciator of the artform should make time to go and download. Recorded in 2007, but thought this was a fairly fitting month to break this out. Jerry Beeks of Bronx Slang is a personal friend and friend of the show, and when I was more in the flow of making beats, we had a little routine of me sending him a few things, him picking from there and writing/recording his lyrics, and then me assembling everything back over this side. As I recall, I wasn't necessarily expecting him to pick this beat, which I cooked up while on a family trip with whatever records were immediately to hand - but he made it work, as always! Great lyrical approach, personifying the dirty cop and referencing real-life incidents from Eleanor Bumpurs to Amadou Diallo to the NYPD officers who acted as hitmen for the Mob (yes, really).